Complainants claimed their cash was held in trust for the sole purpose of making their consoles and, under the terms of RCL's governing shareholders' agreement, should be spent on this alone. “I complained to the SRA because I feel the backers’ money has been mis-appropriated… This legal crusade [has not] made them a single step closer to delivering the Vega+,” one complainant alleged to The Register. Another, whose first computer was a ZX81, said that the Vega+ saga, "instead of rekindling fond memories of my early days with a computer [has] just left me with a sour memory." 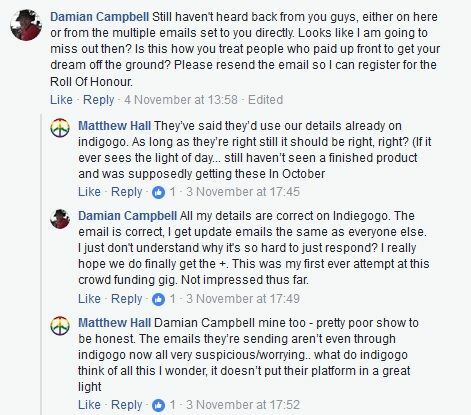 He further claimed: "RCL seem to spend all their energy in attacking people who criticise them instead of spending a moment on actually producing a product they took more than half a million pounds from backers, in good faith, which they appear to have never intended on using to make a product." RCL's ZX Spectrum Vega+, a modern handheld reboot of the venerable ZX Spectrum console developed by Sir Clive Sinclair, was intended to be released to the public in mid-2016 following a successful crowdfunding effort on Indiegogo. Since then RCL has come out with excuse after excuse for not delivering the Vega+, having set numerous new deadlines which have all sailed past without any sign of a product emerging. Aggrieved customers have set up a website chronicling RCL’s activities, along with a section titled “legal resources” that includes, among other things, a template letter for out-of-pocket customers to send to the SRA. The Register has seen confirmation from the SRA to the complainants that it is looking into their claims. “We understand you are one of a number of individuals who have provided funds to a company called Retro Computers Limited ('RCL') to help with the manufacture of a product called Sinclair ZX Vega+,” the SRA told all the complainants, in writing. “We may contact you for further information and may make some enquiries with the firms or individuals concerned,” it added. RCL has been embroiled in a number of legal actions over the past year. As well as the previously reported directors’ legal fight for control of the company and the court costs battle with its former sales agent (see below), it is also facing small claims court action from Vega+ backers determined to get their money back. RCL’s latest reason for not delivering the Vega+ is that it needs to update the “roll of honour” with names of backers who paid extra to have their names hard-coded into the console. Comments under its latest Facebook post appear to show confusion from customers who seem to be being ignored by the firm, which replied to others in the same comments thread. London solicitors’ firm Michelmore LLP, the firm which has acted for RCL over the last year, ignored our invitation to comment on the SRA complaints against it. At the time of writing RCL's website was redirecting to a rather psychedelic 404 page. In other news, former sales agent Nick Cooper has been declared bankrupt, following his own legal battle with RCL. Cooper’s firm, Cornerstone Media, was the link between RCL and major retailers, arranging sales of its Vega and promised Vega+ product and collecting monies due. RCL’s current management, Levy and Suzanne Martin, sued Cooper and Cornerstone when he withheld royalty payments for the original Vega console. Cooper said he did this because Levy and Martin had entered a separate legal dispute, with two other RCL shareholders and former directors, Chris Smith and Paul Andrews, over control of the company. The outcome of that dispute would have determined who was eligible to receive the royalties.